With Eden Hazard down in the early stages of the first half after a solid tackle from Fabinho, the Brazilian used the pause in play to take care of a slight blockage in his nose. But that’s not how Chelsea fans saw it; they claim that the midfield enforcer purposefully blew his nose on the injured Hazard. The camera angle is misleading and if you look closely you can see he’s covering the nostril closest to the Belgian. Equally, Michael Oliver is right next to them and shows no reaction whatsoever. This is a classic case of rival fans trying to kick up a fuss over nothing. 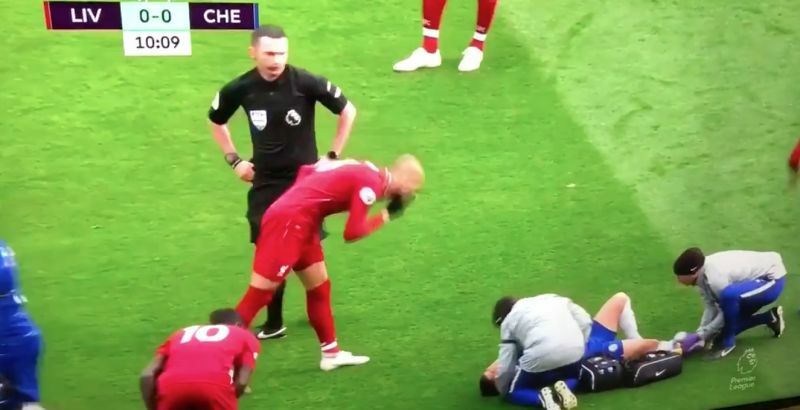 For us, this is a non-issue but, like Fabinho’s nose, we just wanted to clear the issue.